I’m Ingrid. I’m in my thirties and my husband (Vic) and I homeschool our three sons, ages 10, 7, and 5. On this blog, I will call them Kamikaze, Tremendo, and Sweet Coco. Kamikaze loves to help. He loves to “jump in” and get his hands dirty. I admire his wild abandon when he’s having fun. He really enjoys his life. Tremendo is an angelic-faced force to be reckoned with. He has a warrior spirit and a very big heart. Learning about the sheer strength of his will makes me excited to see what kind of man he will be. Tremendo has been diagnosed with Autism and so many of my topics will have a lot to do with his education, as well as mine with regard to Autism. Sweet Coco is very sensitive and kind. He loves to cuddle and loves giving hugs and kisses. He’s fascinated by cars. His loving spirit is very healing. He has a speech delay and I suspect would also be diagnosed with Autism if we were to go that route. As for me, I have various interests including personal development, knitting, pagan and occult spirituality, and natural family living. I also have an online store where I sell unique, hand-finished items, as well as baby carriers and cloth diapers. 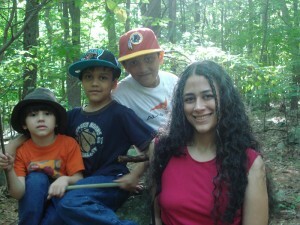 Its first purpose is for me to document, process and share my perspective on homeschooling. Its second purpose is to be a source of inspiration for me. Writing and thinking about homeschooling inspire me to pay attention to my interactions with my children and keep me on the path towards the highest good of all. The blog’s third purpose is a means of earning extra income (homeschooling while needing therapy can get expen$ive). I used this quote because I first encountered it at a difficult time in my life. I was feeling very overwhelmed by life and I went through bouts of feeling good and sorry for myself. Reading this quote reminded me that ultimately, beyond alphabets and colors and speech and reading and stimming and boundaries, my desire is to get to know my kids and like them.